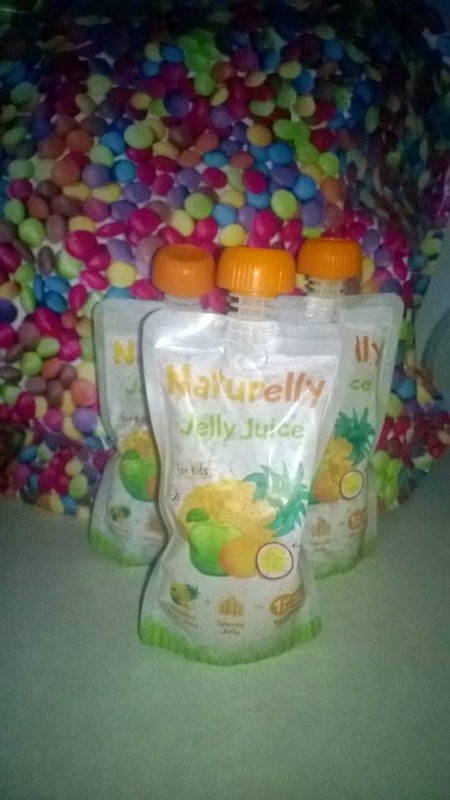 Trials & Tribulations Of A Brummie Mummy: Naturelly Jelly Juice Drink Review. Naturelly Jelly Juice Drink Review. Last week we received a huge box of 24 Naturelly Jelly Juice drinks. Both of my kids love juice and jelly, so I thought they would be great to test out this new drink, but I will be totally honest and say I thought the texture would be pretty strange but it surprised me. Naturelly is an all-natural Jelly Juice drink made from fruit juice and gellan gum. Gellan Gum is a dietary fibre that helps fill your child up for longer. It is a very special non-animal gel source which is suitable for vegetarians and people with religious dietary practices. The drink comes in the following flavours Totally Tropical, Summer Fruits and Apple. I don't like to buy heavy sugar drinks for the kids so I was pleased to find out that this contains natural sugars only. The squeezy pouches are great for when you are the go, with a cap to reseal they are perfect to pop in a bag to take anywhere then throw away, so you aren't carrying bottles around all day. Both the kids enjoyed the jelly juice and the texture its actually really nice no lumps. Its just a smooth watery jelly perfect snack and drink.